It's Kyle Busch's world and we're all just living in it. After qualifying 32nd for Saturday night's Toyota Owners 400 at Richmond Raceway, it looked like Busch's winning streak was in jeopardy. Instead, the 2015 champ made it three in a row by running away from Denny Hamlin and Kevin Harvick in overtime. Busch's win was notable for several reasons. First, it gave him another five playoff bonus points, and it marked just the fourth time in 42 years that two separate drivers have won three straight races in a single season. Should he prevail at Talladega, Busch will be the first driver to win four straight races since Jimmie Johnson accomplished the feat en route to the 2007 championship. How Busch won the race: The yellow flag flew with 30 laps to go after a crash involving Jamie McMurray and Ryan Newman exiting Turn 2, with Newman's No. 31 dropping fluid all over the three-quarter-mile oval. On the ensuing round of pit stops, Busch's pit crew got the No. 18 off pit road ahead of pole-sitter Martin Truex Jr. and Stewart-Haas Racing teammates Clint Bowyer and Kevin Harvick. From there, Busch did exactly what he needed to hold off the pack through a series of late restarts to get his fifth career win at Richmond. Busch tied Buck Baker for 15th on the all-time wins list with 46 wins in NASCAR's top series. "I can't say enough about Adam Stevens and my guys," Busch said. "The pit crew, tonight, they won the race for us. They got us off pit road first those last two times we came down for tires and got us where we needed to be." 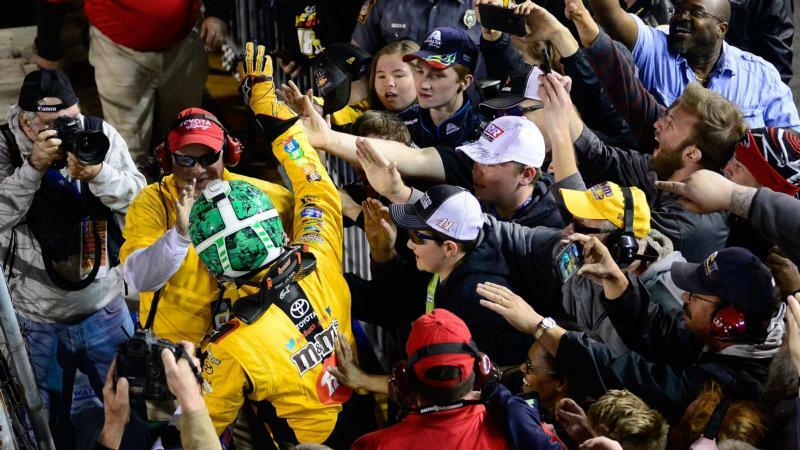 Man of the people: Last week, Kyle Busch appeared on Dale Earnhardt Jr.'s weekly podcast to recall the 10th anniversary of the duo's late-race run-in at Richmond in 2008. After taking the checkered flag, Busch celebrated his win Saturday by taking a page out of former teammate Carl Edwards' book — by climbing into the stands and celebrating with fans amidst the loudest cheers Busch has received in a long time. Listen to the most recent episode of the Dale Jr. Download with Kyle Busch. "It's the 10-year anniversary of you know what," Busch said. "I was wondering if I'd come out alive. I think it was certainly different tonight. I saw a lot of yellow along the front fence line and don't worry, I was looking to see who was there and decided to give those guys and some kids some high fives and what's ups." 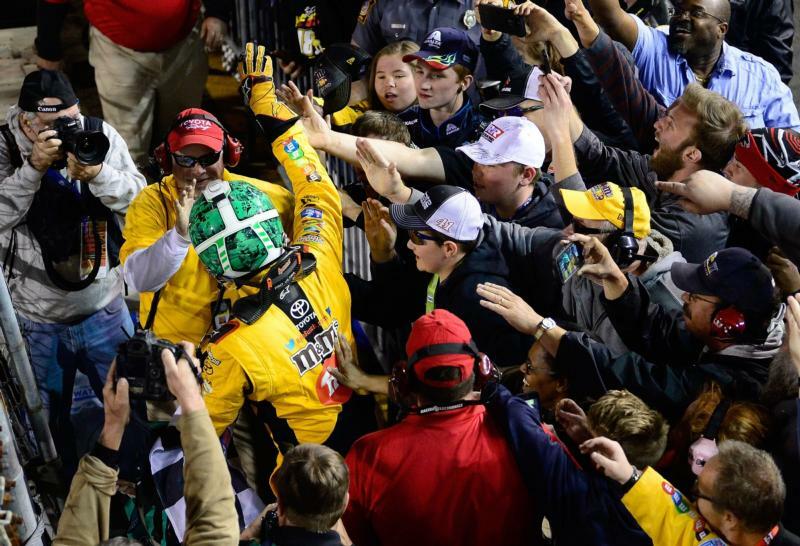 Team owner Joe Gibbs said he didn't know Busch actually went into the stands until he was asked after the race. "Oh my gosh," Gibbs laughed. "You should not do that, you know the risk! Anyway, that's great though. He went up there and came back. That's what's even better, they didn't keep him." Saturday Night Special: After running the last two spring races in the daytime (due to rain in 2015), Richmond moved this year's race back to its traditional Saturday night with a start time of around 6:45 p.m. The fans responded in a big way with a strong crowd on hand for a superb night of short track racing. While several people questioned moving what was a competitive race in the daytime back to night, the on-track product didn't suffer and NASCAR fans showed their support by filling the stands Saturday night. Much like Bristol the week before, the folks at Richmond could've have asked for a better advertisement for their first-ever playoff race in September. Congrats, Kurt: Kurt Busch had another career milestone Saturday, becoming the 20th driver in NASCAR Cup Series history to lead 9,000 laps. Busch led 98 laps en route to an 11th-place finish at Richmond. The elder Busch ran in the top five and top 10 throughout most of the race, but a run-in with Daniel Suarez on pit road put the No. 41 outside the top 10 in the race's final stage. As Suarez exited his stall, the left front of his machine yanked the air gun out of Busch's tire changer, slowing down his stop and ended his hopes of victory. Busch's milestone leaves no doubt that the 2004 Cup champion should be a lock for the Hall of Fame when he decides to call it a career. Hendrick happiness: To say 2018's been a struggle for Hendrick Motorsports would be an understatement. But leaving Richmond, Team Hendrick has to be feeling better about where they stand in the garage area. Chase Elliott brought his No. 9 machine home second, while Jimmie Johnson rebounded from an early brush with the wall to finish sixth. Normally, a sixth-place finish wouldn't be much to write home about for the seven-time champ, but on the heels of a third-place result at Bristol, things are on the upswing for the 48 team. The second-place finish was Elliott's eighth of his career, tying him with his dad Bill for second-place finishes before his first Cup win. Only three drivers in history have compiled more runner-ups than the Elliotts before their first trip to victory lane: James Hylton (12), Harry Gant (10), and Sterling Marlin (9). Rookie William Byron also had a good run, keeping his No. 24 in the top 10 the entire first half of the race before a speeding penalty on pit road dropped him to the rear and a 12th-place finish. Frantic finish: After going incident-free through the first 350 laps, things got testy over the final 50 circuits Saturday night. The first "natural" caution of the race came on Lap 355, when Ryan Blaney and Ricky Stenhouse tangled off Turn 4, with Brad Keselowski making a late evasive move to avoid Stenhouse's spinning machine. The intensity continued to ratchet up as Jamie McMurray pounded the wall exiting Turn 2 and took out his frustration on Kyle Larson. McMurray slammed fenders with his teammate a couple times under yellow before ending the night in 19th. Social Spotlight: Just because Brexton Busch wasn't in victory lane doesn't mean he didn't get to celebrate. Samantha Busch tweeted a cute video Sunday, saying that when Brexton misses victory lane, his parents bring it to him. What comes next is a box full of confetti and another victory celebration for the 2-year-old. Good luck stopping Stewart-Haas: One of the biggest storylines coming into this season was the questioning of how Ford would keep up with Chevrolet and Toyota despite having the oldest body in the Monster Energy NASCAR Cup Series. All Stewart-Haas Racing has done is win four of the first nine races with their four drivers combining to lead 1,001 laps. Kevin Harvick kicked things off by winning three of the first four races and Clint Bowyer won his first race in nearly six years at Martinsville, and with how Kurt Busch and Aric Almirola are running, don't be surprised if SHR has four cars in the playoffs. Bloomin' Monday: Kevin Harvick's fifth-place finish means we all win Monday at Outback Steakhouse. All you have to do is go to your local Outback, tell them you're there for Bloomin' Monday and they'll bring you a fresh Bloomin' Onion for free! Next week: Kyle Busch will look to make it four in a row at the biggest wildcard on the schedule: The Geico 500 at Talladega. And the NASCAR Xfinity Series will again be Cup-free for Round 3 of the Dash 4 Cash as four drivers duke it out for $100,000 in the Sparks Energy 300. With Kyle Busch and Kevin Harvick already scoring three wins apiece, Sunday's race at Talladega could be a chance for teams outside the playoff grid to find their way to the playoffs.